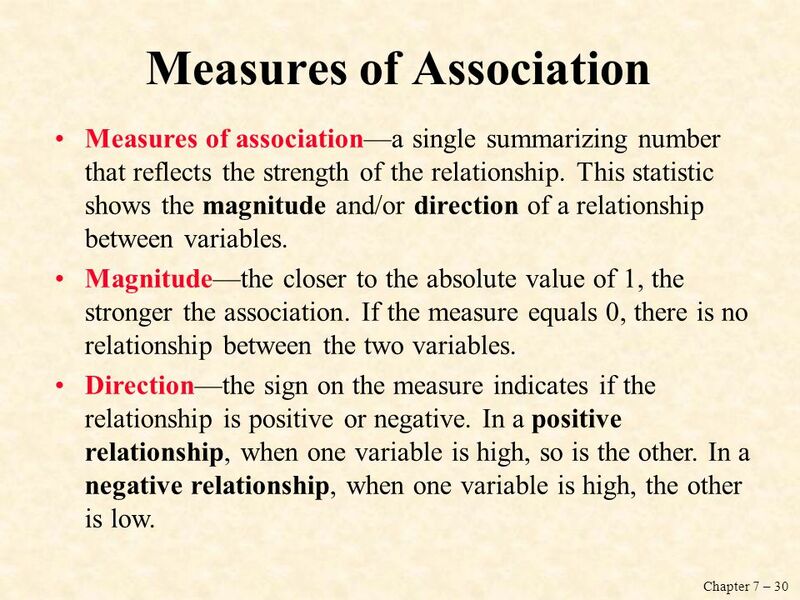 Measure of association—a single summarizing number that reflects the strength of a relationship, indicates the usefulness of predicting the dependent variable from the independent variable, and often shows the direction of the relationship. 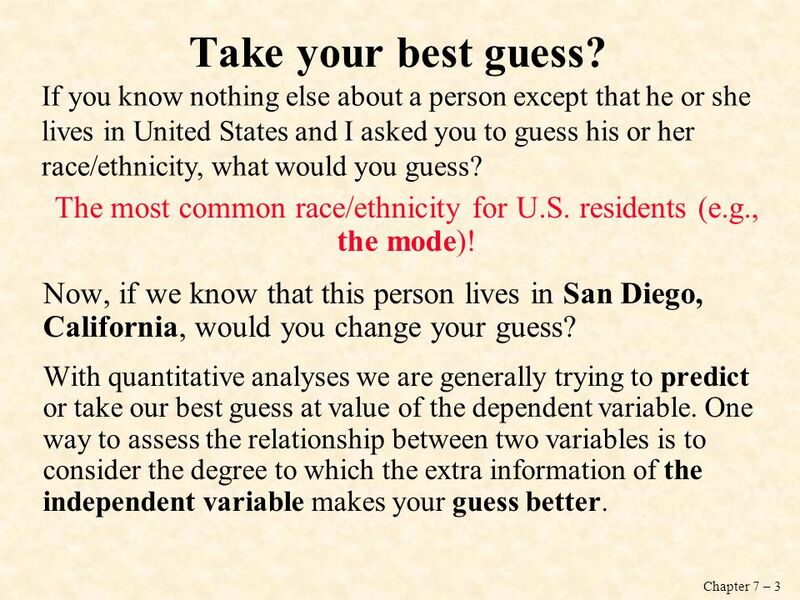 3 The most common race/ethnicity for U.S. residents (e.g., the mode)! Take your best guess? If you know nothing else about a person except that he or she lives in United States and I asked you to guess his or her race/ethnicity, what would you guess? The most common race/ethnicity for U.S. residents (e.g., the mode)! Now, if we know that this person lives in San Diego, California, would you change your guess? With quantitative analyses we are generally trying to predict or take our best guess at value of the dependent variable. 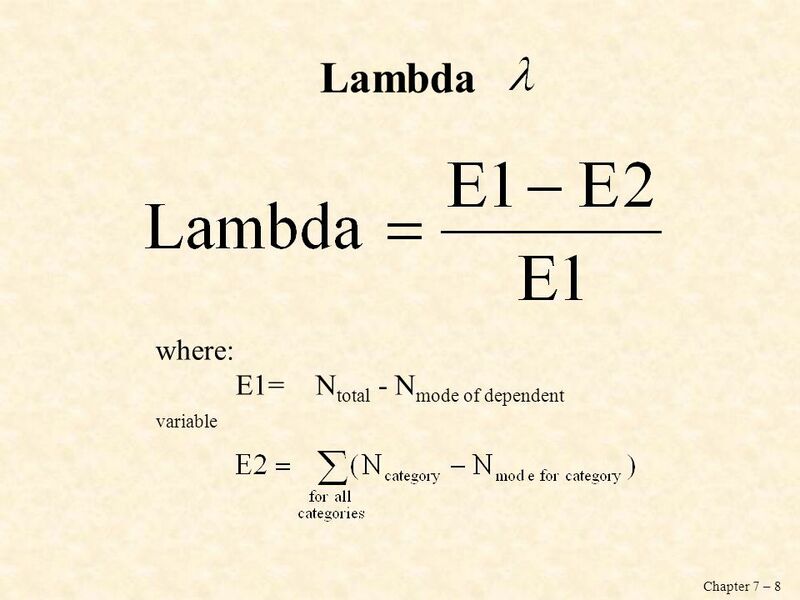 One way to assess the relationship between two variables is to consider the degree to which the extra information of the independent variable makes your guess better. 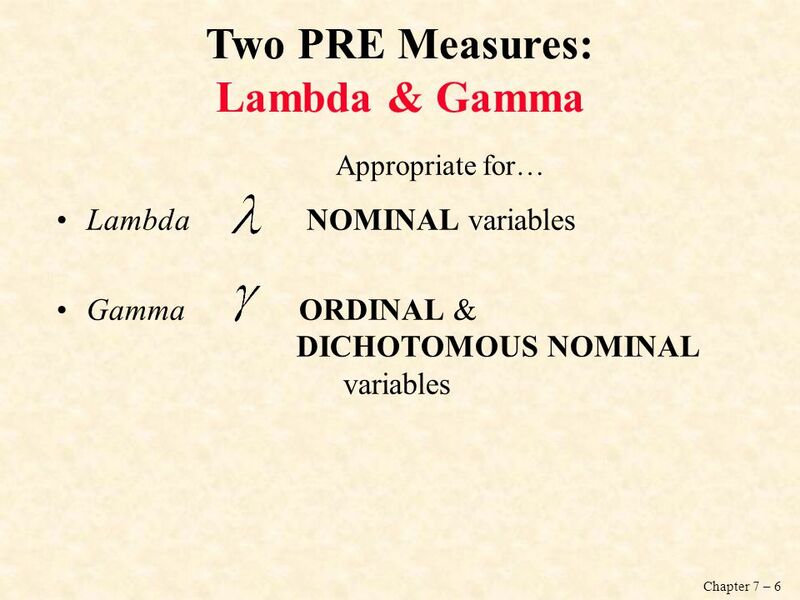 PRE—the concept that underlies the definition and interpretation of several measures of association. 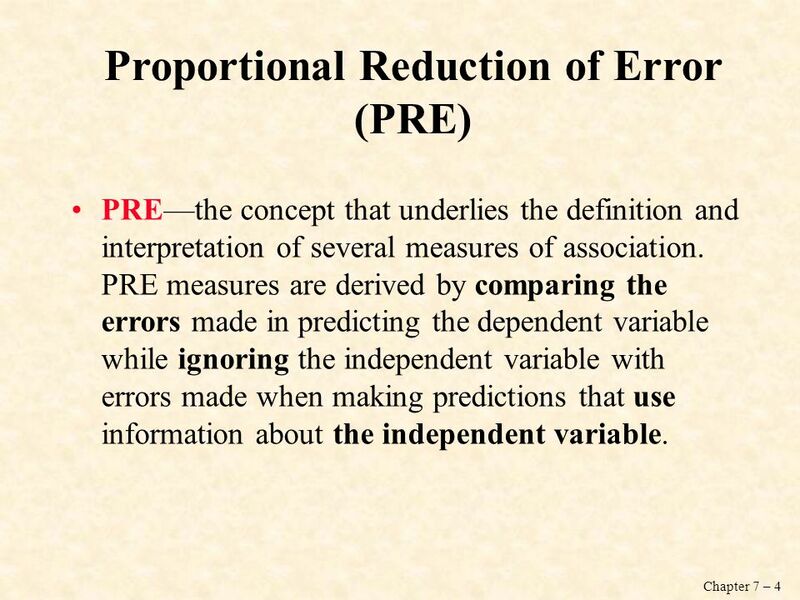 PRE measures are derived by comparing the errors made in predicting the dependent variable while ignoring the independent variable with errors made when making predictions that use information about the independent variable. 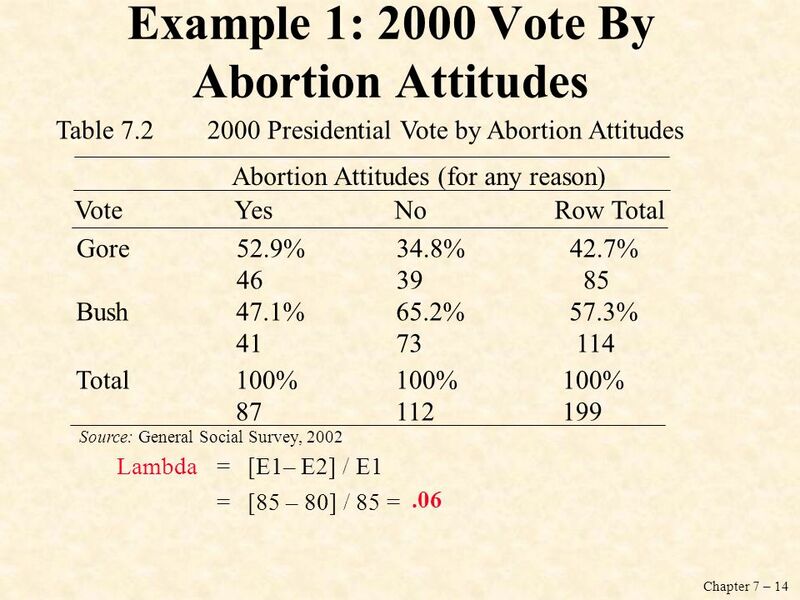 Table Presidential Vote by Abortion Attitudes Abortion Attitudes (for any reason) Vote	Yes	No	Row Total Gore Bush Total Source: General Social Survey, 2002 Step One—Add percentages to the table to get the data in a format that allows you to clearly assess the nature of the relationship. 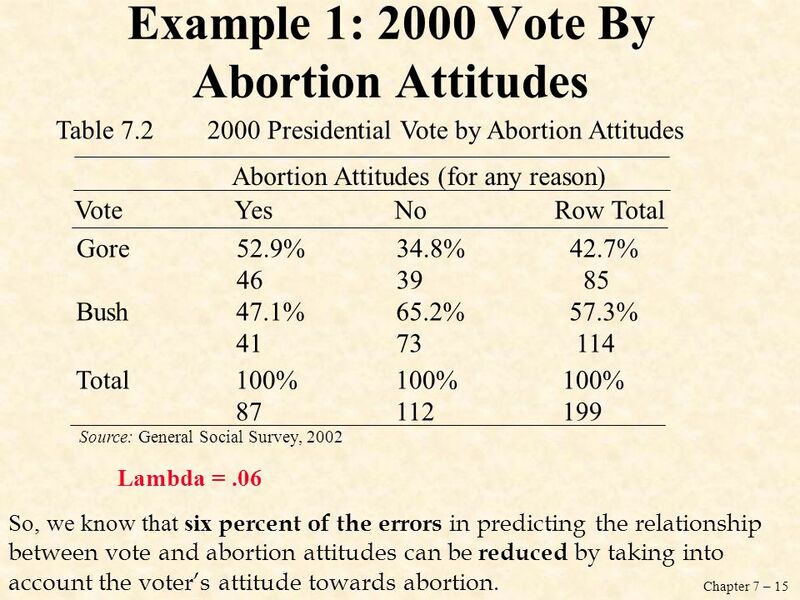 Table Presidential Vote by Abortion Attitudes Abortion Attitudes (for any reason) Vote	Yes	No	Row Total Gore	52.9% % % Bush	47.1%	65.2% % Total	100%	100% % Source: General Social Survey, 2002 Lambda = .06 So, we know that six percent of the errors in predicting the relationship between vote and abortion attitudes can be reduced by taking into account the voter’s attitude towards abortion. 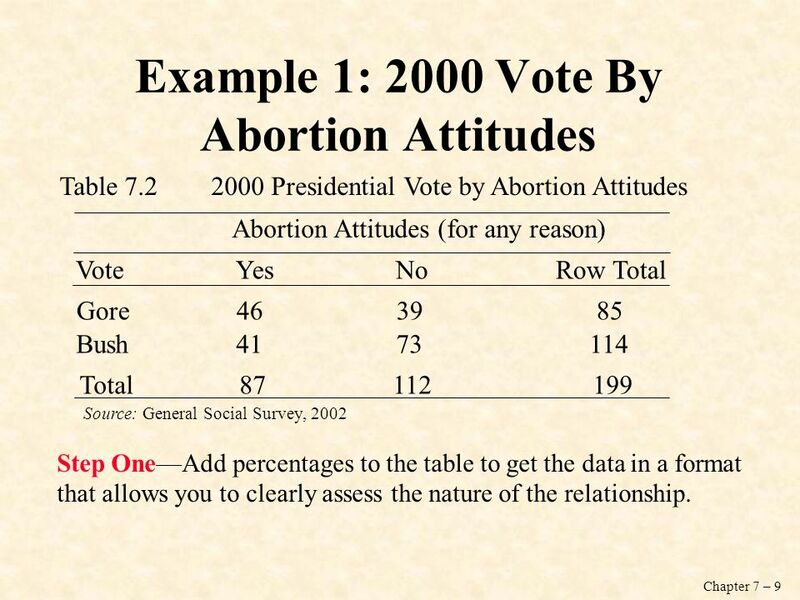 Step One—Add percentages to the table to get the data in a format that allows you to clearly assess the nature of the relationship. 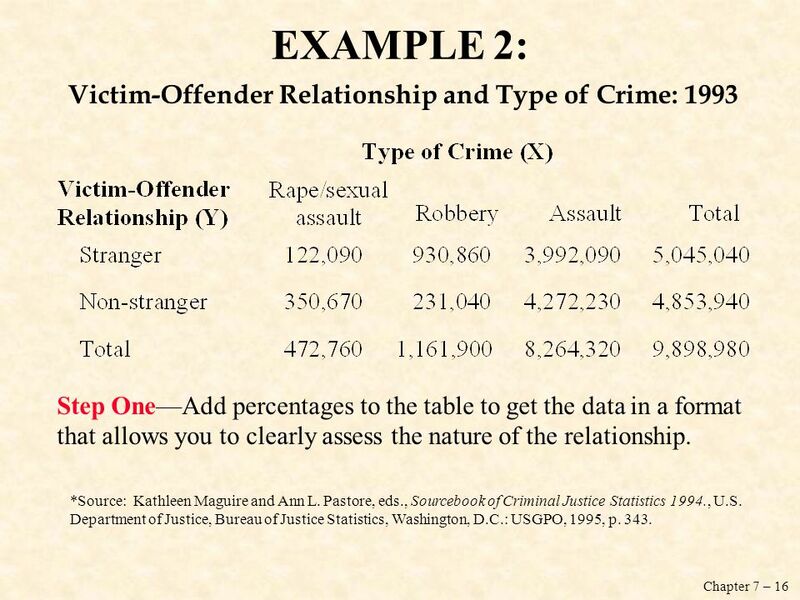 *Source: Kathleen Maguire and Ann L. Pastore, eds., Sourcebook of Criminal Justice Statistics 1994., U.S. Department of Justice, Bureau of Justice Statistics, Washington, D.C.: USGPO, 1995, p. 343. 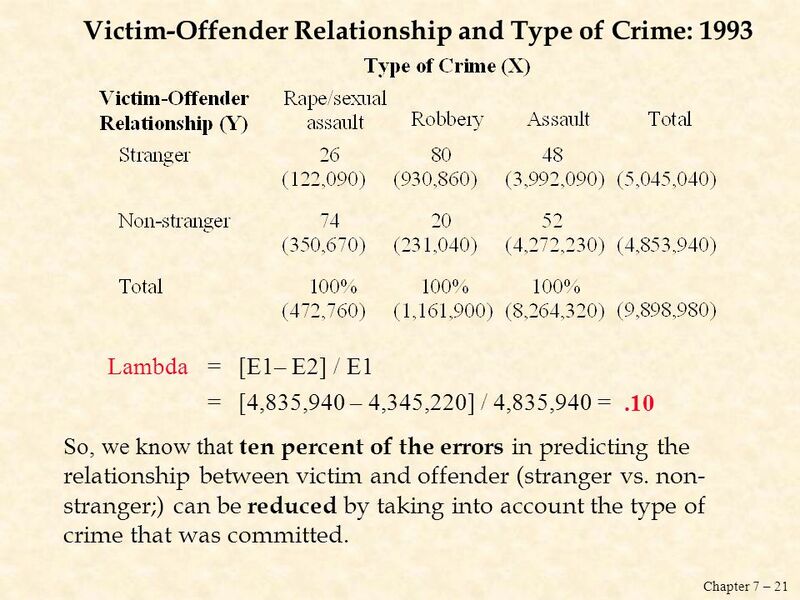 Lambda	=	[E1– E2] / E1 =	[4,835,940 – 4,345,220] / 4,835,940 = .10 So, we know that ten percent of the errors in predicting the relationship between victim and offender (stranger vs. non-stranger;) can be reduced by taking into account the type of crime that was committed. A measure whose value may vary depending on which variable is considered the independent variable and which the dependent variable. 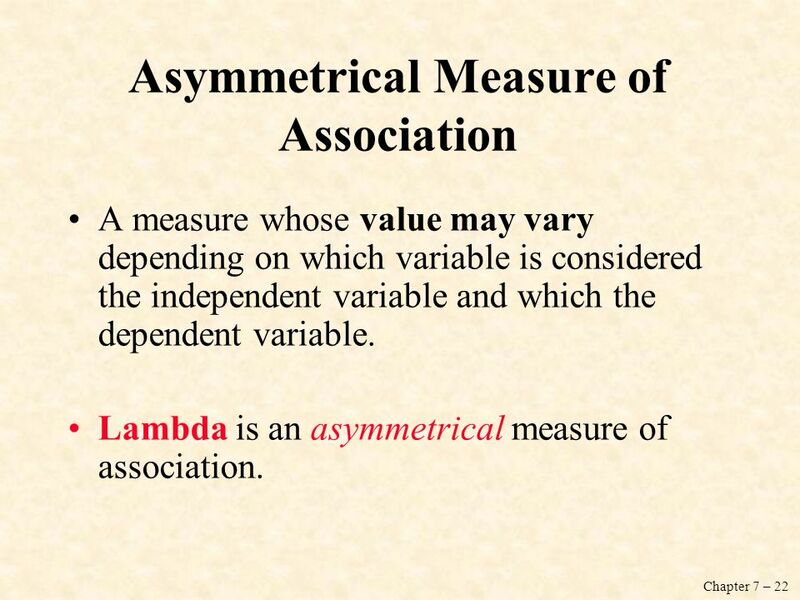 Lambda is an asymmetrical measure of association. 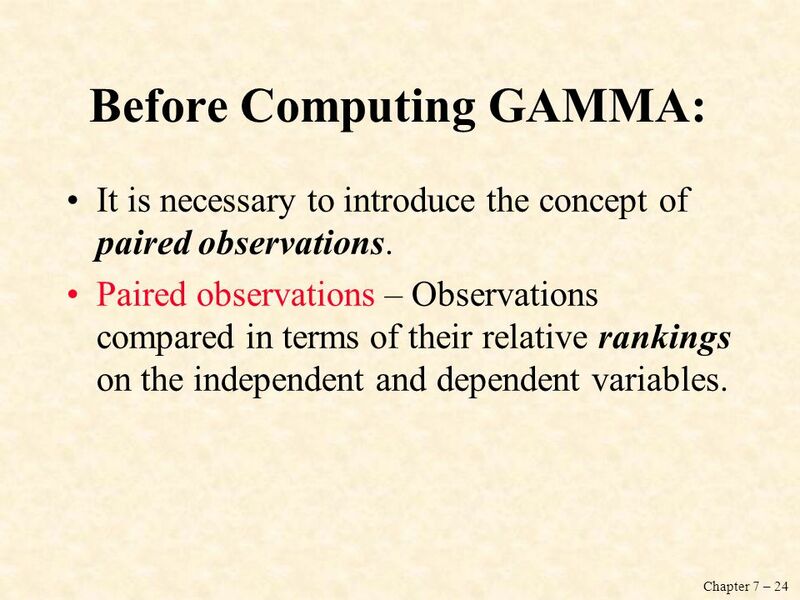 It is necessary to introduce the concept of paired observations. Paired observations – Observations compared in terms of their relative rankings on the independent and dependent variables. 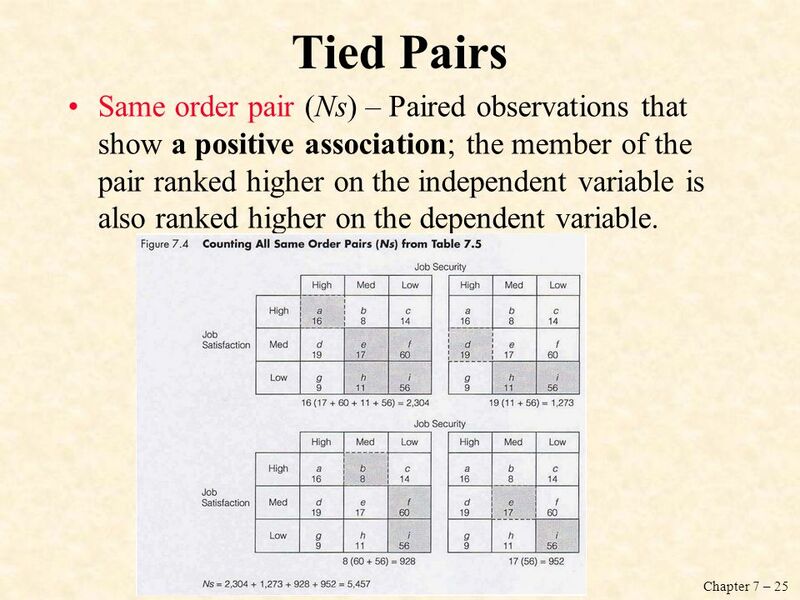 25 Tied Pairs Same order pair (Ns) – Paired observations that show a positive association; the member of the pair ranked higher on the independent variable is also ranked higher on the dependent variable. 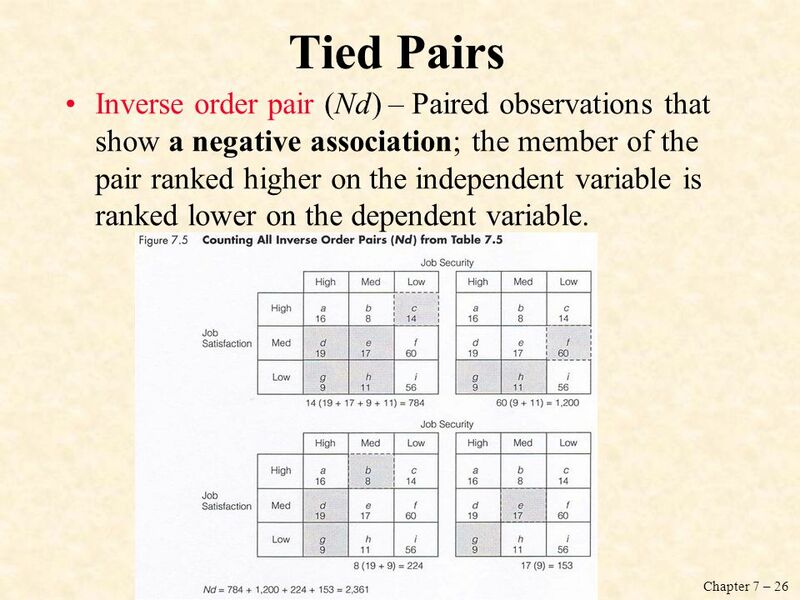 26 Tied Pairs Inverse order pair (Nd) – Paired observations that show a negative association; the member of the pair ranked higher on the independent variable is ranked lower on the dependent variable. 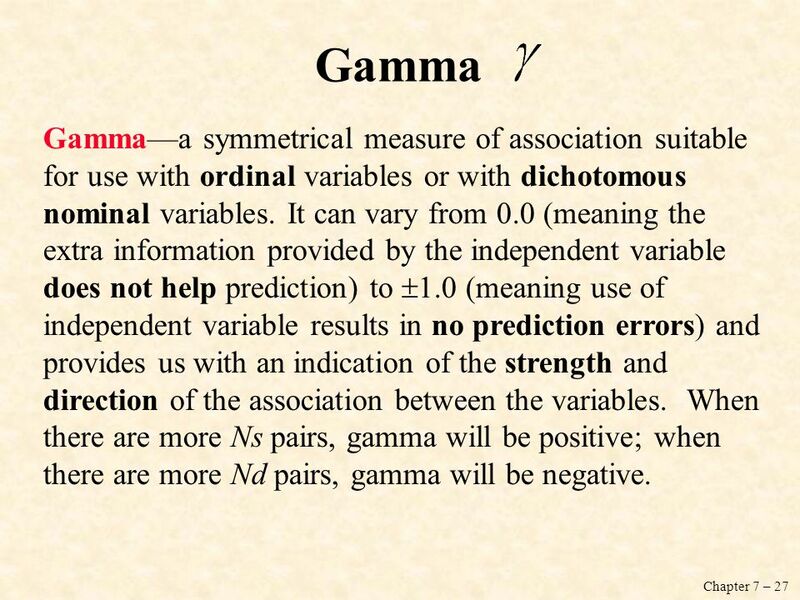 27 Gamma Gamma—a symmetrical measure of association suitable for use with ordinal variables or with dichotomous nominal variables. 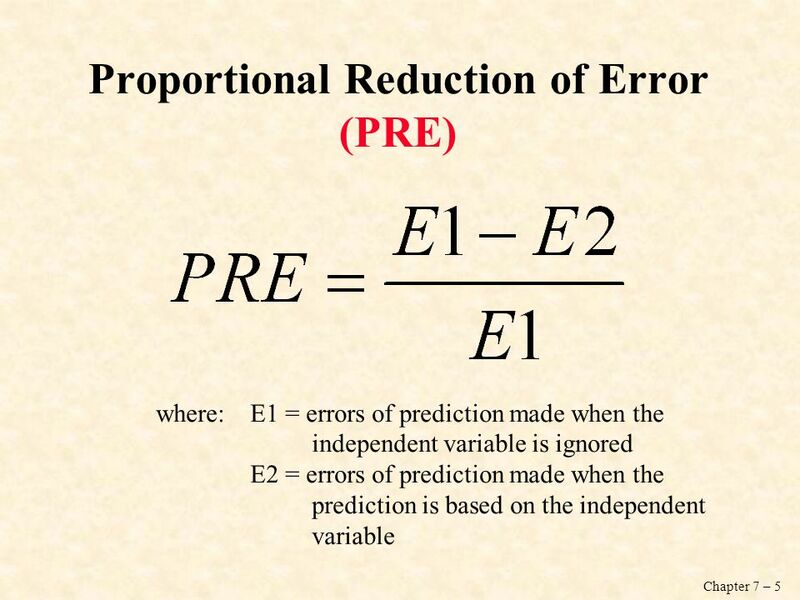 It can vary from 0.0 (meaning the extra information provided by the independent variable does not help prediction) to 1.0 (meaning use of independent variable results in no prediction errors) and provides us with an indication of the strength and direction of the association between the variables. 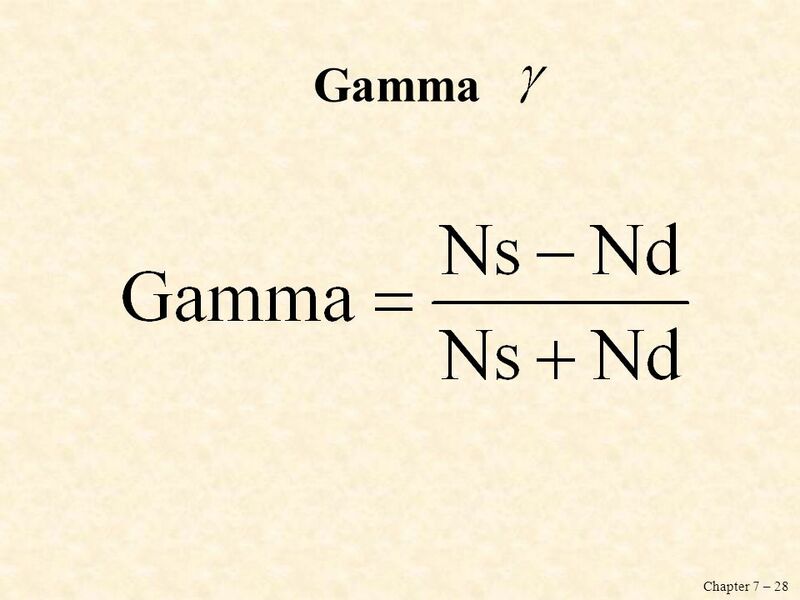 When there are more Ns pairs, gamma will be positive; when there are more Nd pairs, gamma will be negative. 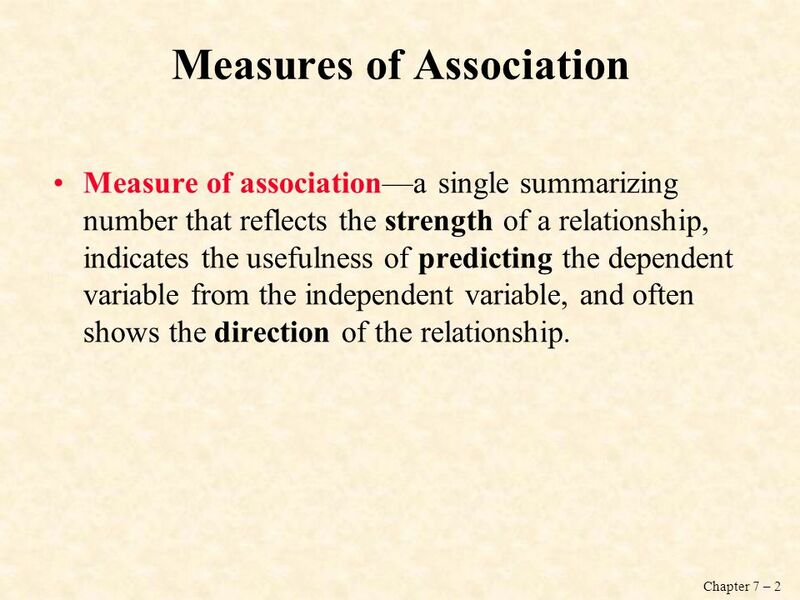 Measures of association—a single summarizing number that reflects the strength of the relationship. 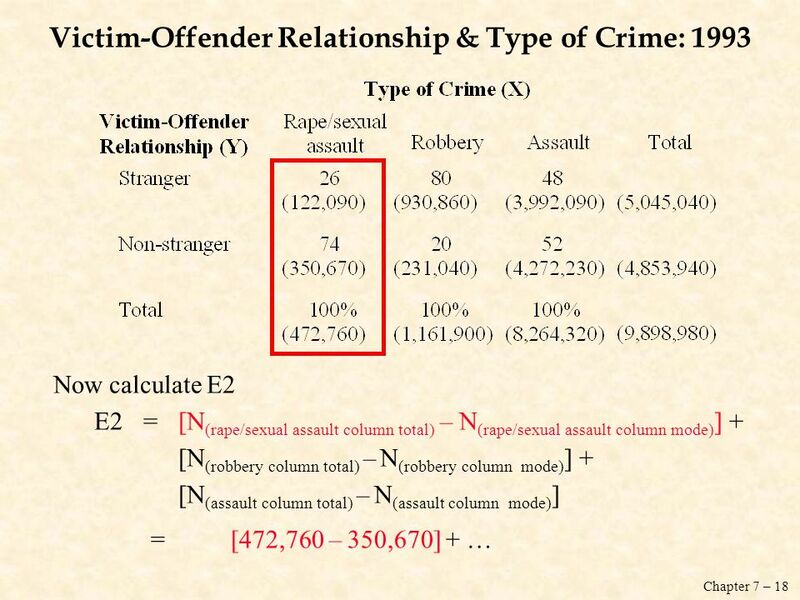 This statistic shows the magnitude and/or direction of a relationship between variables. 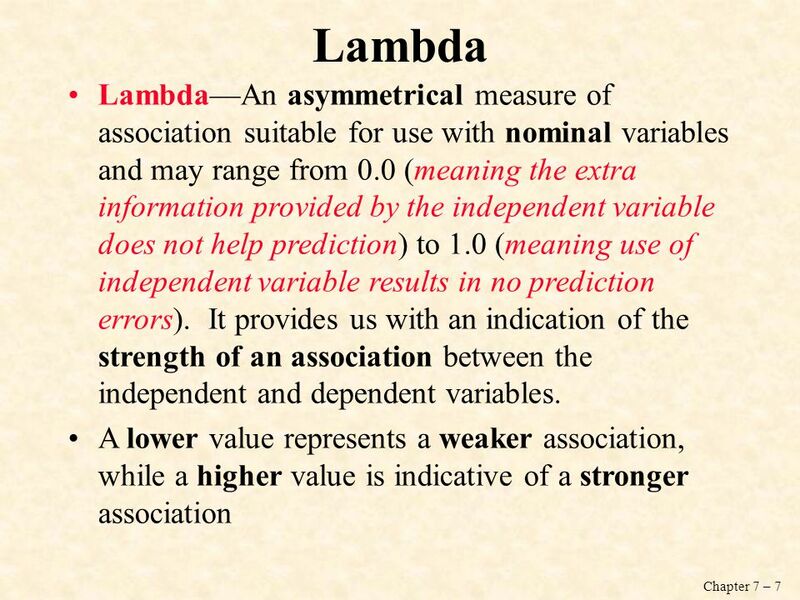 Magnitude—the closer to the absolute value of 1, the stronger the association. 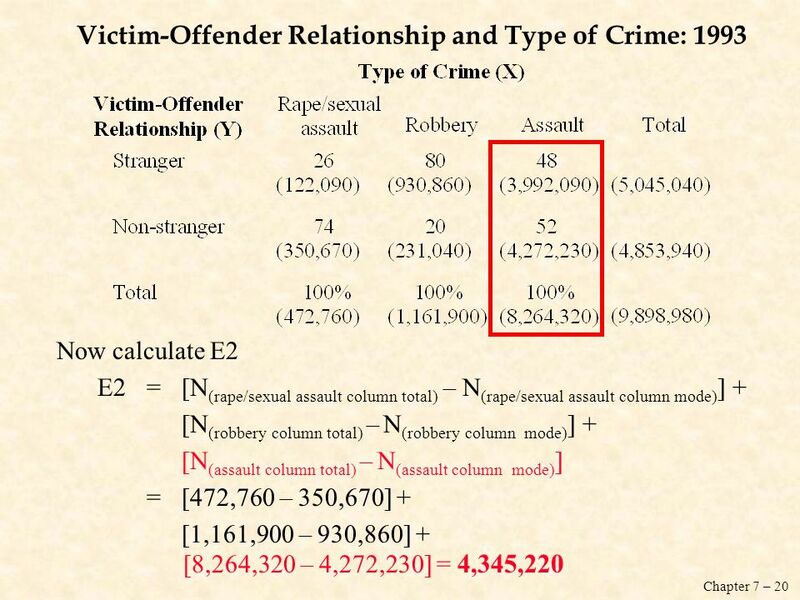 If the measure equals 0, there is no relationship between the two variables. Direction—the sign on the measure indicates if the relationship is positive or negative. In a positive relationship, when one variable is high, so is the other. 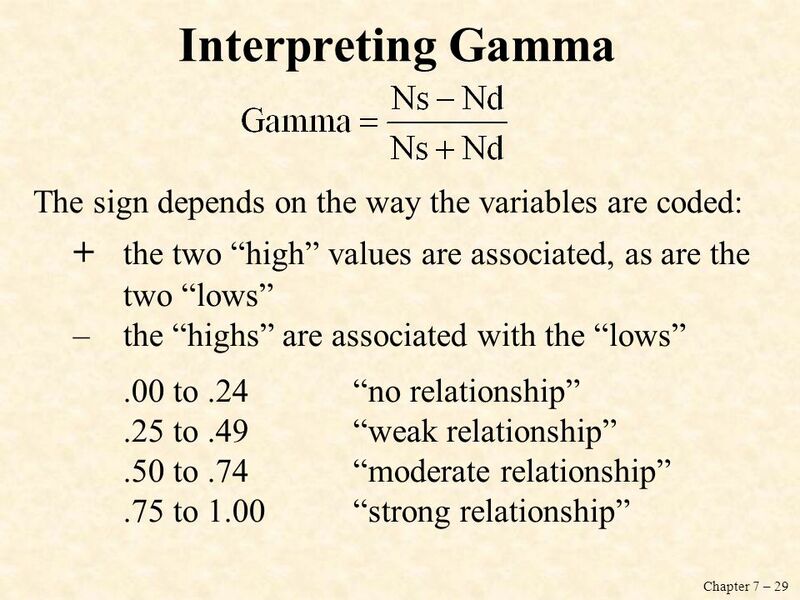 In a negative relationship, when one variable is high, the other is low. 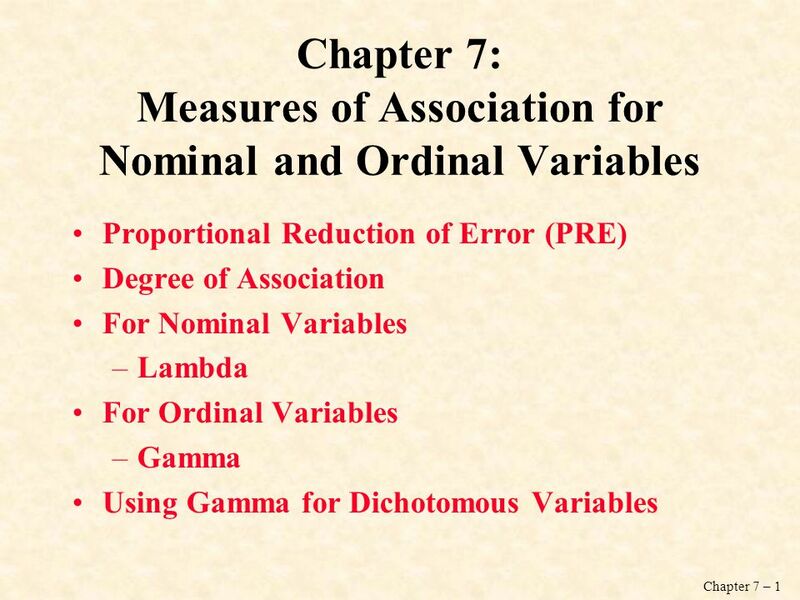 Download ppt "Chapter 7: Measures of Association for Nominal and Ordinal Variables"
Measures of Association for contingency tables 4 Figure 8.2 : lambda – association; +-1: strong; near 0: weak Positive association: as value of the independent. Three important questions Three important questions to ask: 1. 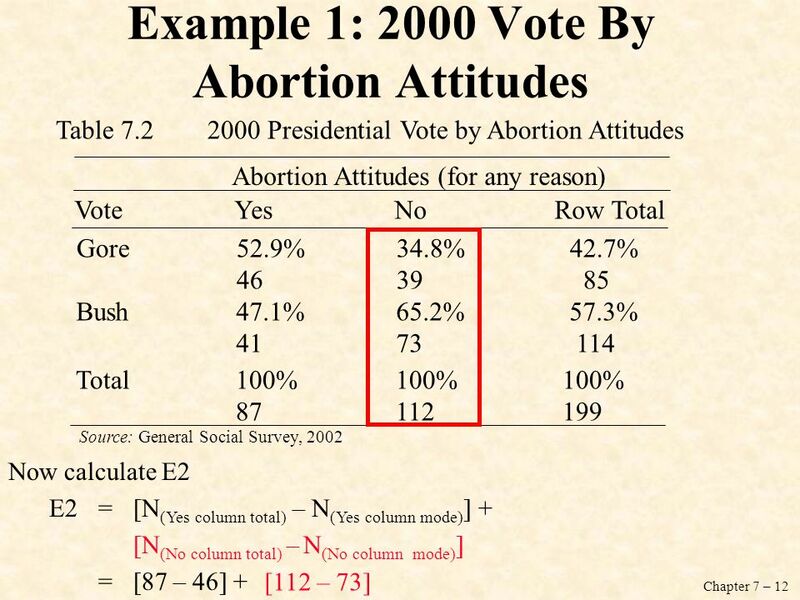 Whether column % change? 2. 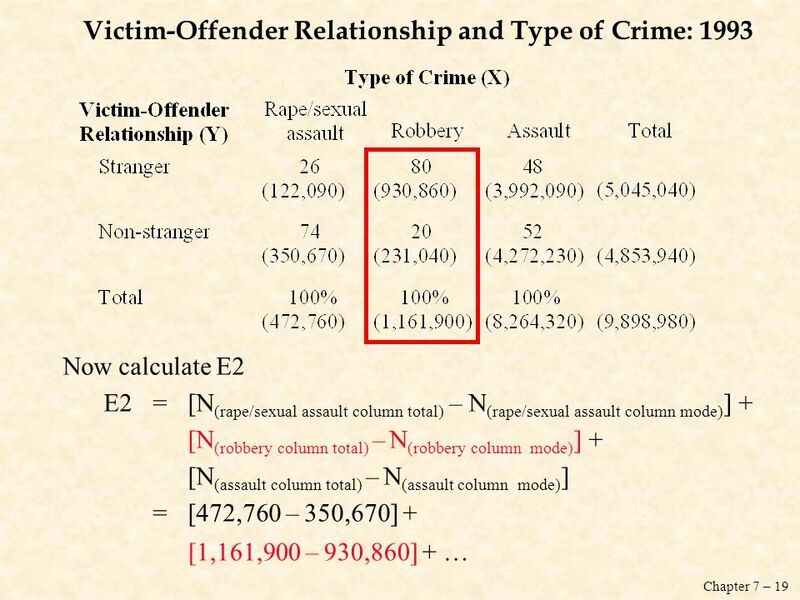 Is the relationship significant? (.05 as chi square significance. 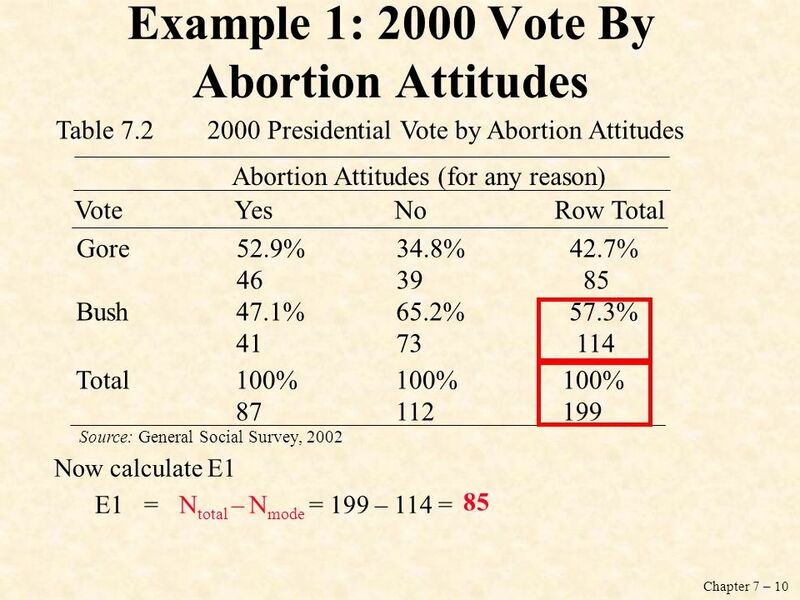 Sociology 601 Class 13: October 13, 2009 Measures of association for tables (8.4) –Difference of proportions –Ratios of proportions –the odds ratio Measures. 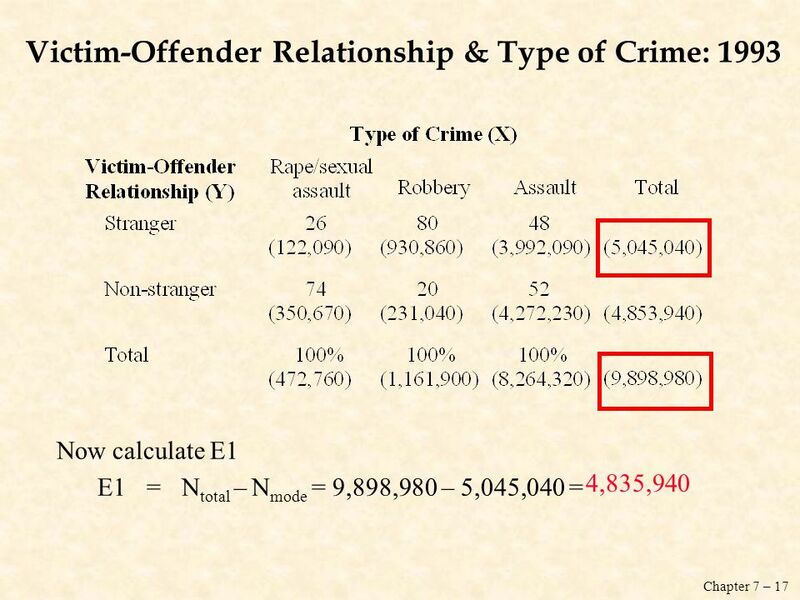 Correlation CJ 526 Statistical Analysis in Criminal Justice. Chapter 15 (Ch. 13 in 2nd Can.) Association Between Variables Measured at the Interval-Ratio Level: Bivariate Correlation and Regression. 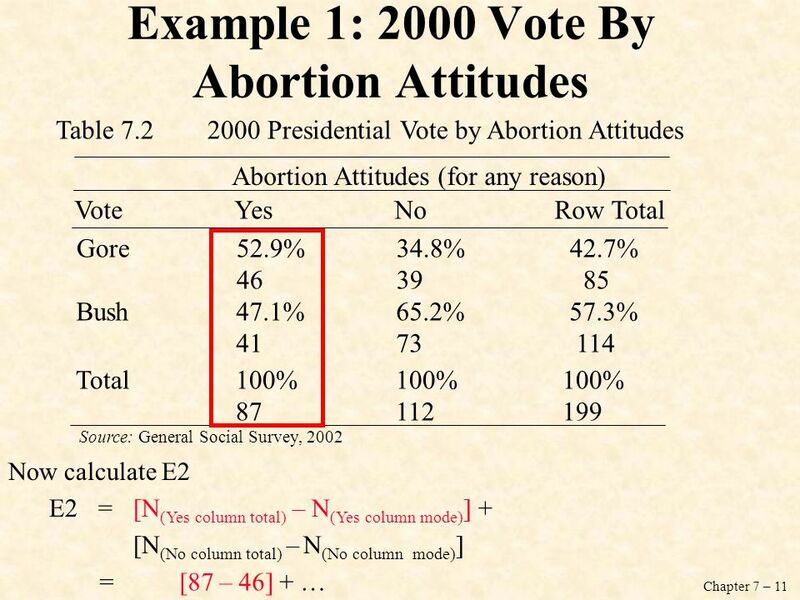 PPA 415 – Research Methods in Public Administration Lecture 9 – Bivariate Association. 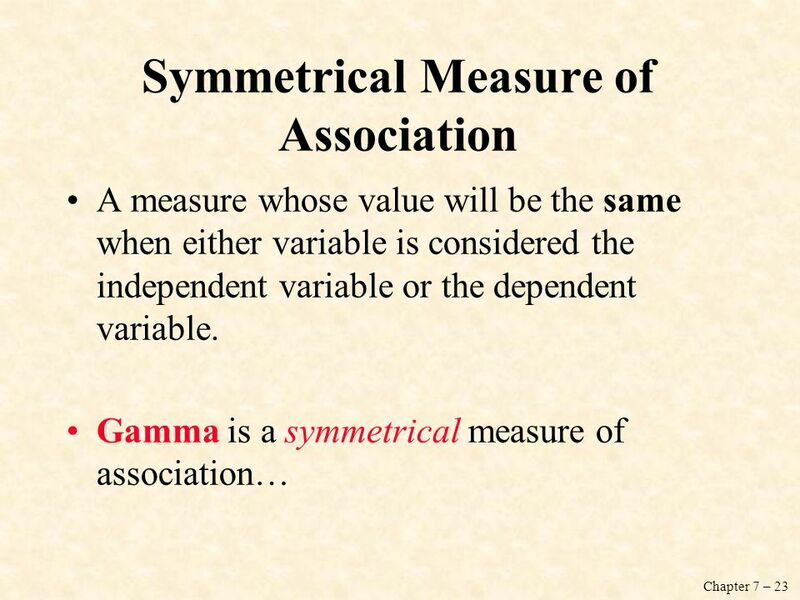 Correlation MEASURING ASSOCIATION Establishing a degree of association between two or more variables gets at the central objective of the scientific enterprise. PPA 501 – Analytical Methods in Administration Lecture 9 – Bivariate Association.